The Pixel is the first Google phone built from top to bottom, and the company thinks it’s finally made the Android device that can conquer the iPhone. It’s a valiant effort, but is it enough? On previous Nexus-branded devices, Google contributed Android software and let manufacturers like LG, HTC, Samsung, and Huawei build the phones. With this device, we have the “Most Google” phone ever, which is more deeply connected to the company’s services. 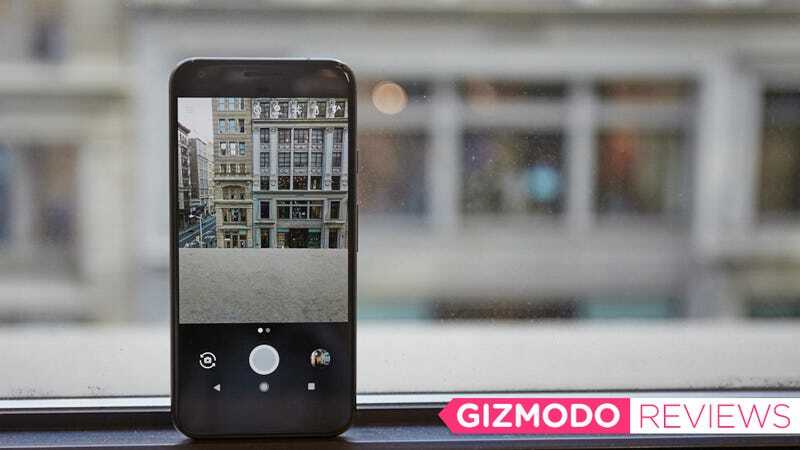 But despite some big ideas, like Google Assistant, and great camera and processor guts, the Pixel falls short of Google’s ambition to make an iPhone-killer. As a lifelong Android user, I couldn’t wait to try the Pixel. It’s different than other Android phones, because it’s the first handset centered around the company’s artificial intelligence—the same omnipotent intelligence that’s vacuuming up information about you every time you use a service like Gmail, Google Maps, or Google Calendar. The “Google brain” learns your habits over time, and can help you find important information faster. The problem is that Google’s AI is too stupid to be meaningfully helpful at this stage. The most obvious place you can see this shortcoming is in Google Assistant, the company’s artificially intelligent competitor to Siri. When you long-press the home button on the Pixel or say “OK Google,” it launches a digital helper that can answer questions and run basic tasks. Out of the box, Google Assistant can do things like set alarms, play music, relay sports scores or weather, translate words, and find nearby restaurants. Google promises Assistant will anticipate your every need, pulling information from email, calendars, and a longview understanding of habits. But in practice, I found Google Assistant to be underwhelming. I took it out on a Friday night thinking it would help me plan a date, and found the results disappointing. I asked Assistant “What’s a good date spot near [bar I was going to].” It served me links to the bar rather than suggesting places nearby. When I asked, “What’s a good date spot near [the address],” Assistant still failed. It showed me a random website from search rather than a map of places I could go. I was particularly disappointed with Google Assistant because it’s such a promising concept. Google is moving attention away from the search bar more than ever. Instead, the company wants you to “Google” by using the messaging app Allo or voice search in Google Assistant. Ultimately, the Pixel and Pixel XL are gateways for feeding the Google brain more information about yourself. As Google’s AI gets smarter, the Assistant will become more helpful. While some people might find this creepy, I think the idea is exciting, and it’s a letdown that the tech isn’t there yet. In fairness nobody has it, and Google’s is better than what’s offered by competitors like Apple’s Siri and Microsoft’s Cortana. The point is that as a whole, smartphone assistants aren’t smart enough to be defining features. They’re gimmicks, and Google unwisely decided to build a phone around one. That brings us to some of the more classic smartphone features. The Pixel has all the things you’d expect from a high-end phone, including two different versions, the 5-inch Pixel and the 5.5-inch Pixel XL. The phones have different batteries (2770 mAh vs 3450 mAh), screens (5-inch vs 5.5 inch), and resolution (1920 x 1080 vs 2560 x 1440), and they start at different prices ($650 vs $770). Otherwise the devices are virtually identical, down to the fingerprint sensor on the back. For my review, I spent a week with the larger Pixel XL. In terms of basic performance, the device delivers what you would expect from a premium gadget. It’s got solid battery life that lasts over a day, a beautiful display, and snappy performance. It’s also worth noting that the Pixel’s software makes it especially intuitive to use for an Android phone. For example, you can launch straight into an action by long-pressing any Google app. Quick tasks, like taking a selfie, can be launched from the home screen by holding down on the app you want to use. (This is, in part, Google’s answer to Apple’s 3D Touch.) Google says third-parties like LinkedIn and Evernote are already adding shortcuts, so we can expect more of this in the future. The Pixel comes equipped with a ridiculous camera that scored a high rating from benchmarkers DxOMark. Google has really harped on this feature, and based on our naked-eye assessment, the Pixel lives up to most of that hype. Every shot is accurately colored, super sharp compared to other Android phones, and vibrant as hell. It still leaves you wanting more compared to the iPhone 7. The Pixel’s photos appeared to be washed out and just weren’t as vibrant as the ones we took with the new iPhone. I can’t imagine that making much difference if you’re just uploading photos for fun. These photos were taken mid-day just seconds apart. When HDR is on, the image processing lags a bit, but the phone is so fast, it’s hardly noticeable. There’s also a great “smart burst” feature that fires the shutter button at about 10 frames per second, giving you a nice slow-motion reel you can make a gif or choose a single frame from. It also makes getting the perfect photo from an action shot much easier. This is all nice, but not groundbreaking. The iPhone does the exact same thing. The Pixel is an ugly phone. The design is a little fatter than last year’s Nexus 6P, and the bezel on the bottom lip of the phone is much bigger. Yuck. There’s also a big slab of glass at the top of the phone’s back that feels sticky and a little uncomfortable to hold. The design is nowhere near as sleek, clean, and easy to use as the iPhone 7. These are all weirdly regressive design choices, but the most regressive is that the phone isn’t water resistant. Even the iPhone is water resistant now, and Apple is notoriously behind on features like that. Your Google Pixel is always one clumsy move away from drowning in the toilet. Take it from someone who has only ever owned an Android: The Pixel is not a major step forward for the platform. The great thing about Google’s old reference design phones, like the Nexus 6P, was that you’d get a premium phone for under $500. At $650, the Pixel is as expensive as most flagships for no good reason. If you’re like me, and have avoided the iPhone all these years, it’s time to give in. The iPhone is definitively better this year. The current roster of flagship Android phones are a complete joke. The Galaxy S7 at least looks nice, but it’s already more than six months old. If you must buy an Android phone, the Pixel makes a strong case. But I can no longer heartily endorse buying an Android, because if this is the best phone available, it’s time to move on. How is this better than my Nexus 6P again? Correction 10/18/16: This post was corrected to say “slab of glass” instead of “slab of plastic” on the phone’s back. It was also corrected to say the Pixel is “fatter” instead of “wider and taller” than the Nexus 6P.